Marine Education and Research Society - See A Blow? Go Slow! Thank you for your interest in how to be a responsible vessel operator in the presence of marine wildlife. 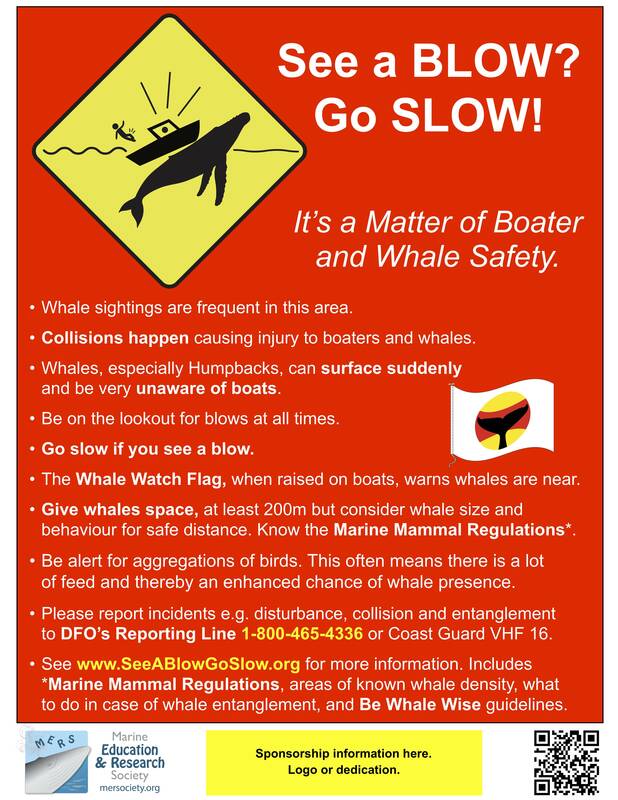 Our "See a Blow, Go Slow" campaign provides information about Marine Mammal Regulations in Canada, how to avoid collisions with marine mammals, and what to do if a collision or entanglement occurs. If you have witnessed an incident of concern, please call the DFO Incident Reporting Line at 1-800-465-4336. (f) tag or mark it. - 100 m for all other whales, dolphins and porpoises. (DFO Incident Reporting Line 1-800-465-4336). Whales, dolphins, and porpoises can surface very unpredictably in front of your vessel. Baleen whales such as Humpback Whales can remain submerged for 15 to 20 minutes and often exhibit random travel patterns. Always be on the lookout for blows and other indicators of whale presence such as aggregations of birds (see below). Watch for vessels flying the "Whale Watch Flag". This signals that whales are near (see below). Increase vigilance in areas of known whale density. Click to enlarge and for information on sponsoring a sign. Slow down. Speed should not be more than 7 knots when 200 to 400m from a whale. Do not position beside "bait balls" of small schooling fish (as indicated by aggregations of birds). Stay clear of the whales' path. Do not approach within 200m. If a whale surfaces within 200m of your vessel, place engine in neutral (or ideally shut off the engine) until the whales are beyond 200m. Follow additional "Be Whale Wise" points below. DFO Incident Reporting Line at 1-800-465-4336 (or if out of cell range, report to VHF 16). If possible, without further stressing the whale, get photos that show the injury and allow the whale to be identified (dorsal and / or tail photos). See below for further detail on what to do in case of entanglement. Humpback Whale blows can be 2m high but are difficult to see in windy conditions. The blows of smaller whale species, such as Minke Whales and Killer Whales, can be much more difficult to detect. Whale Watch Flag: If you see this flag, it means that whales are in the area. Reduce speed and proceed with enhanced caution. To obtain a Whale Watch Flag email us at . Aggregations of birds often indicate that there is a lot of feed in the area and thereby an enhanced chance of whale presence. The coloured areas on these maps indicate locations of known whale density off northeastern Vancouver Island, with the dark blue areas highlighting regions where enhanced caution is especially required. Note that the locations of individual marine mammals cannot be predicted with certainty, and therefore the key points to avoid collision should always be followed. 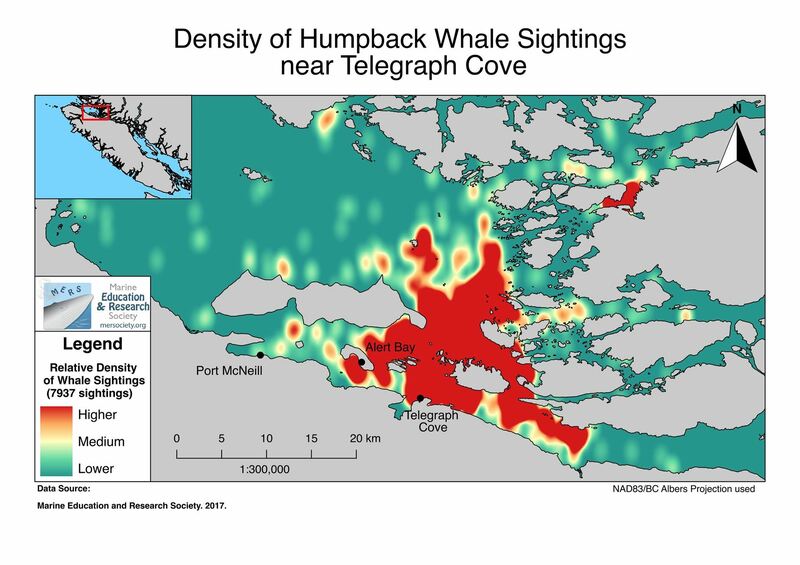 Map of areas of known whale density off Telegraph Cove / Port McNeill (based on MERS research). Click to enlarge. 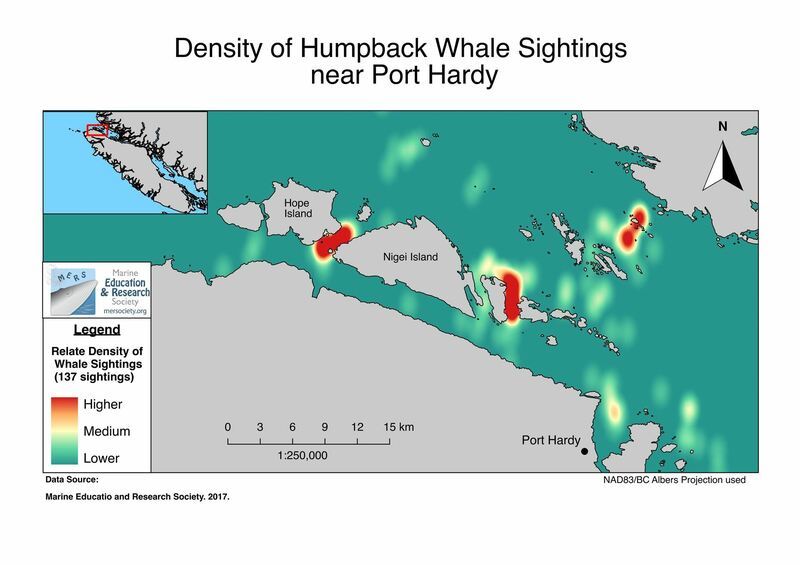 Map of areas of known whale density off Port Hardy (based on MERS research). Click to enlarge. 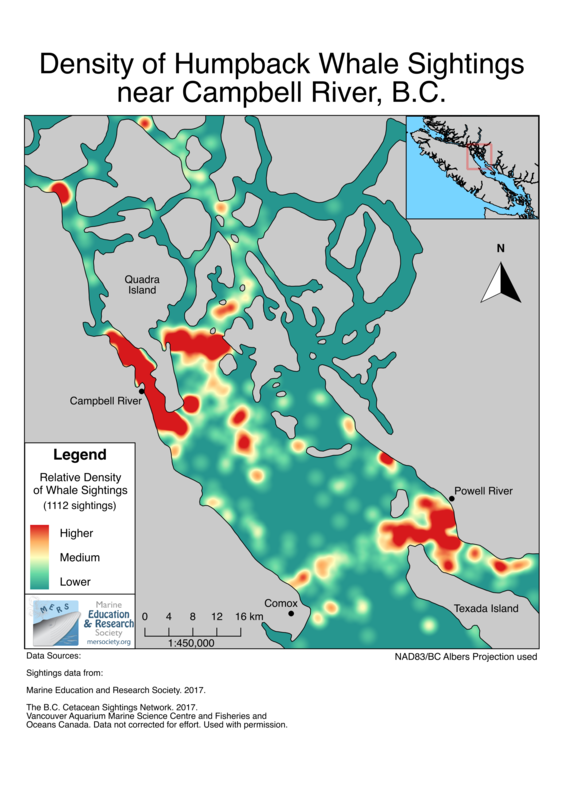 Map of areas of known whale density around Campbell River and Comox (based on MERS research and B.C. Cetacean Sightings Network data). Click to enlarge. 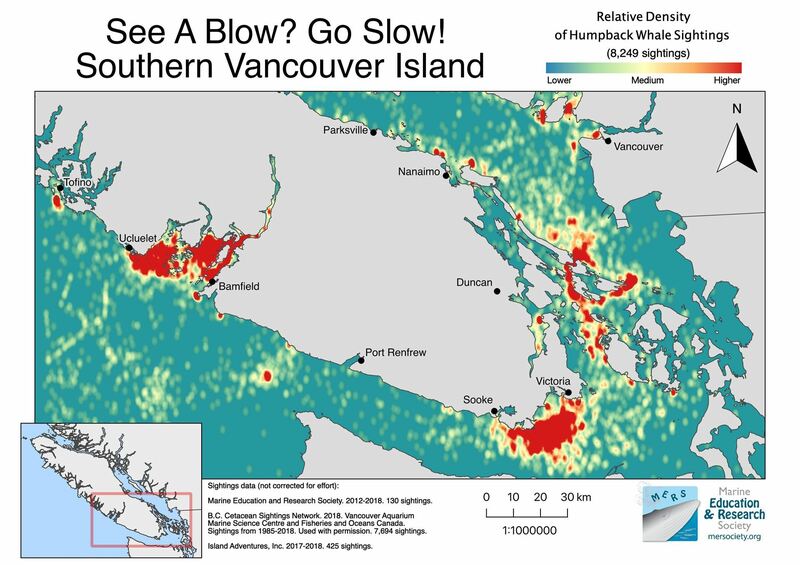 Map of areas of known whale density around Southern Vancouver Island (based on MERS research, B.C. Cetacean Sightings Network data and Island Adventures Inc.). Click to enlarge. Note that only vessels flying a triangular yellow pennant (like the one to the left) are licensed by Fisheries and Oceans Canada (DFO) to undertake research on marine mammals. This may involve approaching marine mammals within the 200m limit for research purposes. The lettering MML indicates "Marine Mammal License" and the number identifies the individual researcher. Additional Guidelines - "Be Whale Wise"
BE CAUTIOUS and COURTEOUS: approach areas of known or suspected marine wildlife activity with extreme caution. Look in all directions before planning your approach or departure. BE CAUTIOUS AND QUIET when around haul-outs and bird colonies, especially during breeding, nesting, and pupping seasons (generally May to September). REDUCE SPEED to minimize wake, wash and noise, and then slowly pass without stopping. AVOID approaching closer than 100 metres. DO NOT disturb, move, feed, and touch any marine wildlife, including seal pups. If you are concerned about a potentially sick or stranded animal contact the DFO Incident Reporting Line at 1-800-465-4336. With increasing numbers of Humpbacks on BC's coast, the risk of whale entanglement has become greater. Preliminary results from research conducted by MERS and DFO suggest that over 47% of Humpbacks in BC have been entangled (>1,000 Humpbacks). This data provides an indication of how serious the risk of entanglement is but does not reveal how many Humpbacks die after becoming entangled. With great urgency, report the entanglement with location to the DFO Incident Line / VHF 16. 1-800-465-4336. Take whatever video/photos are possible but maintain a distance that doesn't stress the whale. 2. disentangle the whale even if it is relocated. Trailing gear at the surface provides the opportunity for trained responders to attach a tag to track the whale and/or to attach floatation to maintain contact with and slow down an entangled whale. Loss of this gear can significantly reduce rescuers' ability to save the whale.